Connecting with the wisdom and wonder of celestial cycles and rhythms is a beautiful way to tap into your innate relationship with nature. And the moon – somehow both mysterious and reliable – is a sweet and generous welcome to this vast territory of self-reflection and growth. That’s what this Moon Chart journey invitation is about. Back in 2015, I began really paying attention to the daily moon signs, and noticing how this did or did not effect my personal experience and creative flow. I’ve noticed a distinct connection for me between the Moon phases, elements and signs, and my own creative energy for my daily practice, projects and process. I’m still noticing. It’s fascinating… and so helpful. And I’m betting some of you might be interested in exploring this, too. 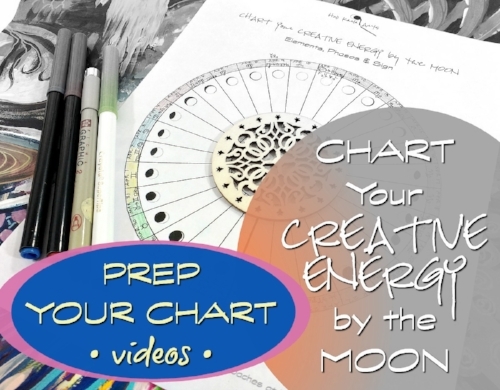 If you already have a moon charting system going – you can tweak these ideas into your own format – perfect! I actually do this in my linear calendar most consistently, out of convenience. However, the circular format is particularly helpful when beginning to connect with the cycle, as well as for those of us who are resonant with visual + circular ways of learning and recognizing patterns or themes. So, let's get you started...and please note, that while this demo took place around the New Moon in Aries of 2017, you can start your chart with the most recent New Moon and follow the same ideas for the lunar cycle happening right now. Starting with the middle black circle on the bottom of the chart wheel – representing the New Moon – write the date of the last New Moon (according to your location) in the outer rim (write small, leaving a little extra space for the moon sign). Below is a video where I walk you through this step with musings on what to consider and basic ideas around paying attention to the moon phases. HERE is an online calendar that can be customized to your location, that will show you the New Moon date, as well as the Moon sign changes, which we'll add later. Next, make a list of words to describe feelings, moods or states you often experience in your creative practice or process… such as: resistance, flow, inspired, productive, all-over-the-place, detail-oriented, quiet, energetic, etc. Then go back through and select 5-10 that are most predominant for you. These are the ones you will use to note your daily overall creative-energy mood on your chart. Even if you simply charted based on what we've done so far, and keep up with it for at least 3 months, you will begin to see meaningful and helpful patterns on how to honor, celebrate, focus and optimize your innate rhythms. The part that gets me most excited, though, is the next part... where we consider the daily moon sign and the corresponding elements, and what these have to say about our creative connectivity. Every 2+ days, the moon moves through one of the 12 zodiac signs, and each sign has its own impression and motivation... and is associated with an element - air, water, fire or earth. Or maybe you have a We'Moon calendar - or another with daily astrological changes. Perfect - grab that. OR, There are apps for daily Moon Phase/Sign tracking, too. I like Phases of the Moon for android (it shows the daily signs, too! ), and Moon Calendar or Time Passages for ios. So, let's add the daily Moon signs to your chart for the current cycle, and consider some ways that just knowing the daily elements might inform and inspire our creative awareness, as well as the layers of patterns within moon charting. For some of you, this will feel like plenty to begin with, even though we haven't even begun to consider each of the 12 signs individually yet. If you are ready to dive in to some of the nuances about how each of the 12 zodiac signs may be felt - and how they speak symbolically and practically to focusing, aligning and nurturing your natural creative energy - then...Join my free Creative Practice Notes for access to a fourth video (plus, other creative freebies) to deepen your charting awareness and experience. There you will find access to an exclusive final video lesson in this charting series. It is a rich and insightful lesson to the practice - and is an excerpt from my immersive program IN THE STARS. Whether you subscribe for some Creative Practice Resources or not, I hope you found something nurturing, revitalizing or inspiring to your creative practice journey with this offering. There are ways you are here to BE in the world, and things you are here to DO, and the wonders of Creative Spirit - including the brilliant and ever-captivating moon - want to nurture your journey and remind you to focus on what matters most to you and your purpose... may it be so.